Dwarfed in size by nearby New River Gorge National River, Babcock State Park is often overlooked by visitors to southern West Virginia. 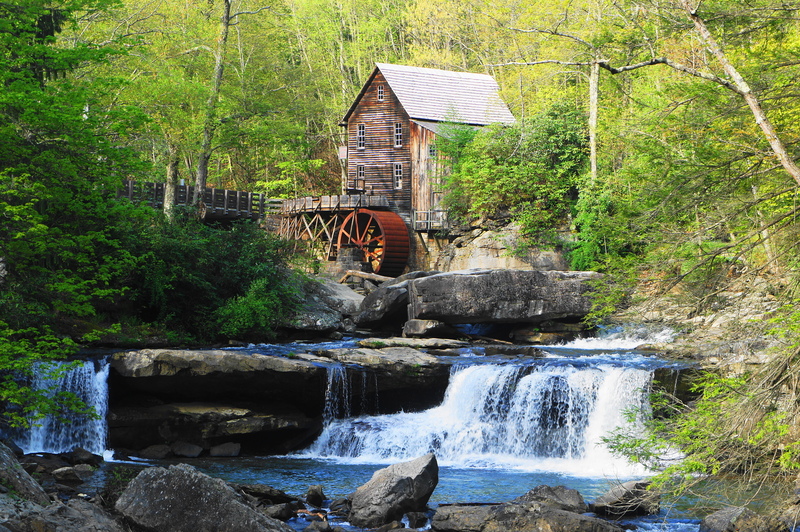 Yet the park, most famous for its photogenic grist mill, offers several excellent hiking options. 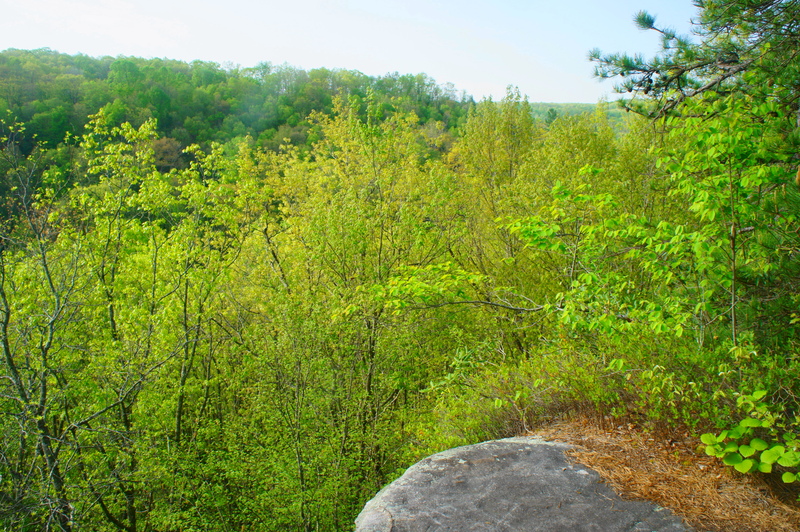 While the best lie elsewhere in the park, the short Island in the Sky Trail is easily accessible from the Park Office and Grist Mill and includes some scenic—yet partly obscured—vistas above the Glade Creek valley. The lower section of the trail follows the base of chiseled sandstone walls before climbing up a rocky crevasse to the rim of the “island,” where an overlook shelter awaits. 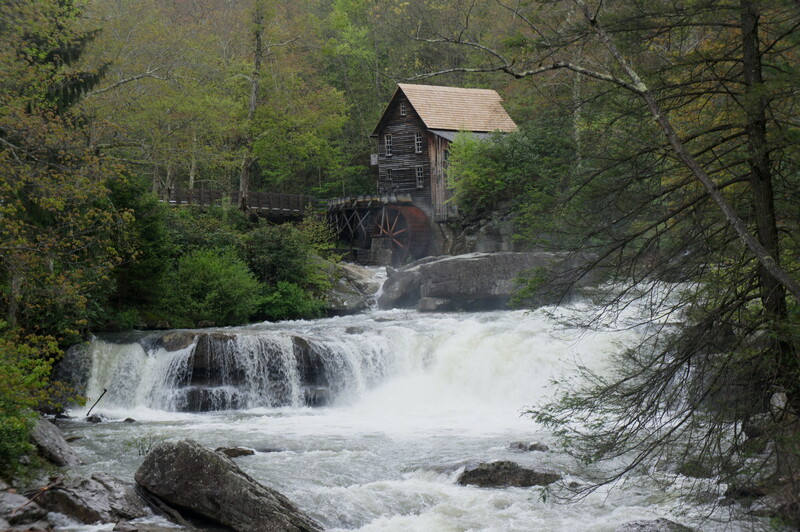 To reach the trail, park at the Park Office and walk across the bridge over Glade Creek to the Grist Mill. Directly across the road from the Grist Mill, away from the creek, you will spot a small sign for the Island in the Sky Trail. Set off up this initially steep footpath, which ascends the western slopes of the valley, putting Glade Creek out of view. The partly asphalted trail eventually gives way to dirt, weaving through a dense thicket of rhododendrons after around 150 yards. A 15-foot cliff emerges on the left, and the path hugs the base of the terraced rock face as it continues northeast. After briefly veering away, the trail rejoins the cliffside about 250 yards into the hike and then descends to clear a minor ravine. In spring and summer, hikers will get a sense of being immersed in a sort of jungle, with the sounds of rushing water in the distance and dense, lush thicket crowding the base of the cliffs. Above the ubiquitous rhododendrons, however, the tall trees are a combination of oaks and maples, a reminder that you remain in the Appalachians, not the Amazon or Congo rainforest. Gradually veering toward the northwest, the trail rounds the tip of the rock “island” at around 2/10 mile. Now heading south, the trail switchbacks up a slope to the base of the terraced sandstone, where a set of wooden stairs provides upward passage. 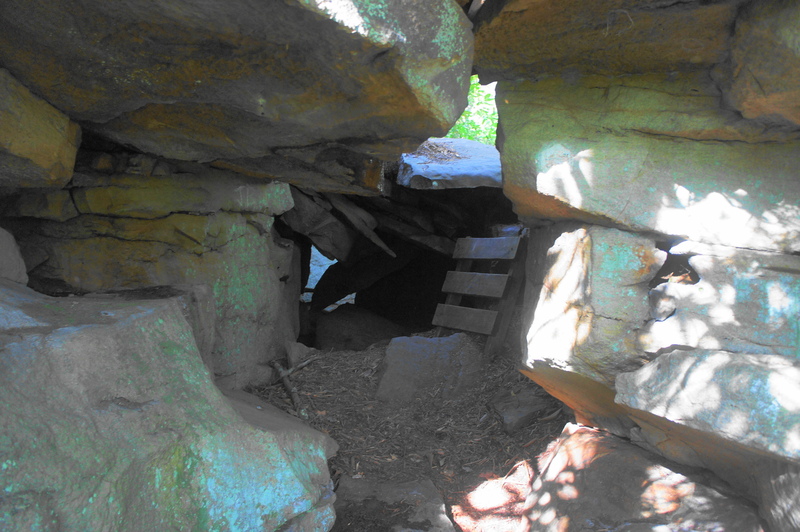 Beyond the staircase, the trail enters a dark and dank crevice, where a small, three-pronged ladder provides the only route up through a hole in the rock. Once out of the notch and back in daylight, you are officially atop the Island in the Sky. Take an immediate left (heading straight dead-ends at a dark drop into the crevasse), then continue to a trail fork at about the ¼-mile mark. Bear left and follow a short and level path to the gazebo, which offers obscured views of the Glade Creek valley below. 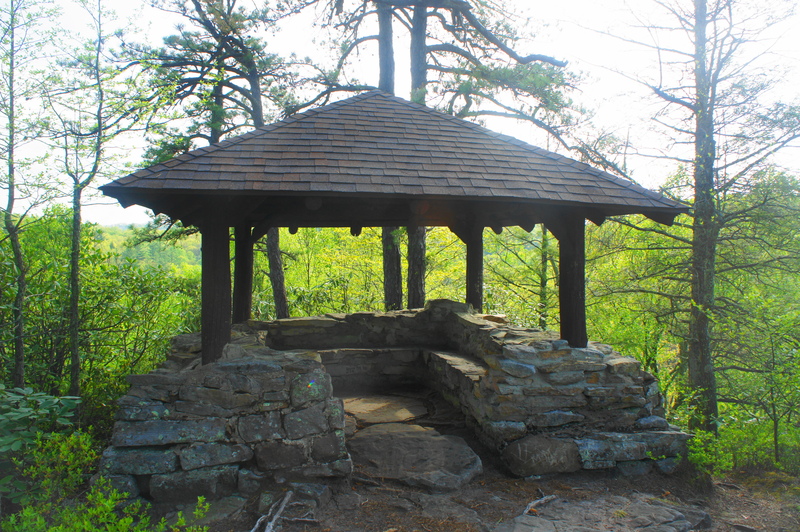 There are better vistas if you leave the gazebo and follow the southern rim, where a couple of social trails lead to the edge of the cliffs. 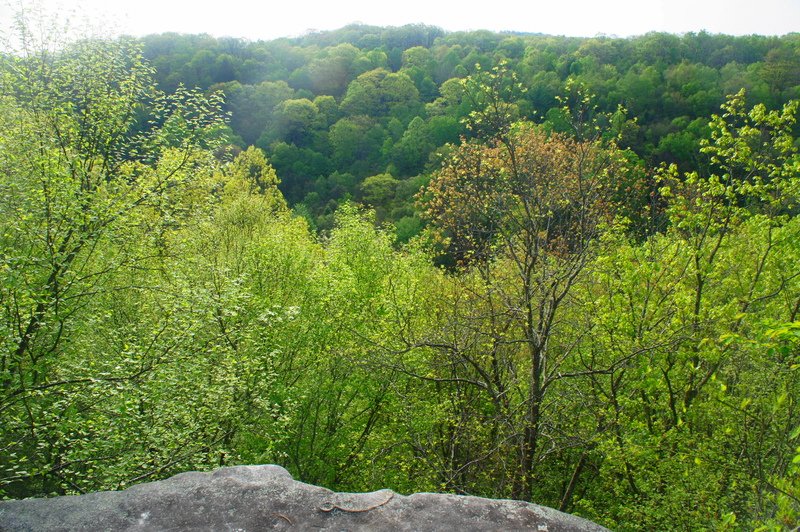 Across the valley, the slopes look much like here—a sea of trees that conceal a line of sandstone cliffs. It’s also fun to look straight down, giving you a bird’s eye view of the trail below the rim over which you passed minutes prior. From the gazebo, retrace your steps back to the trail fork, and this time continue straight as the path widens and remains level. At about 4/10 mile, the path emerges suddenly from the woods and onto the paved Park Forest Road 801. This is the end of the trail. Continue left down the road to return to the Grist Mill and Park Office. Allot 30-45 minutes for this short but moderately strenuous hike. 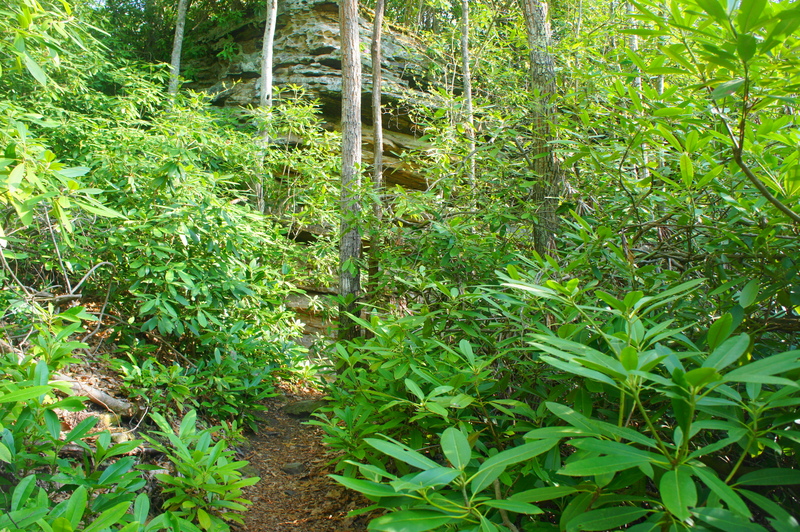 Take a walk around nearby Boley Lake or complete the excellent Skyline Trail – Narrow Gauge Trail loop, arguably the best circuit in Babcock State Park. This entry was posted in Babcock State Park, Uncategorized, West Virginia and tagged Babcock State Park, Glade Creek, grist mill, Island in the Sky, Island in the Sky Trail, Nuttall sandstone, rhododendrons, West Virginia. Bookmark the permalink.